From the author of Amps! 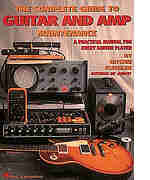 comes an essential survival guide for every guitar player and amp owner. Packed with concise, clearly written tips on troubleshooting and repairs, this guide teaches the secrets of maintenance and fixing it yourself, with straightforward, step-by-step instructions.